Many furniture stores are facing odds that seem impossible to overcome. One furniture dealer from Southern California told me recently that he felt lost in the wilderness with no way out. I was reminded of the movie, “The Edge.” Three men were lost in the virtually uninhabited high country of Alaska after their plane crashed. No one had a clue where they were, there was almost no hope of being rescued. They had no gear, weapons, food or equipment. Cold, hungry, and desperate, they were being stalked by a man-eating grizzly bear. One of the men was a hotshot advertising agency man, one was his young assistant, and one was a highly successful businessman. Contemplating their situation, the adman and his assistant were terrified, and deteriorating into a panic mode. The assistant blurts out: “We are going to die!” The businessman remains cool. He asks his companions, “Do you know why most people who are lost in the wilderness die?” The two panicky men are puzzled, they have no answer. “What is that?” the ad man asked. So it is with many home furnishings dealers. Sales are slow. Nothing they are used to doing seems to be working. The “grizzly bear” of low cash flow seems to be lurking in the shadows, moving ever closer. These furniture men want to think out of the box, but they usually begin with too many preconceived ideas. Don’t let this happen to you. I have seen creative retail solutions achieve miracles. To begin the process of the mind game that could change your destiny, wipe the slate clean. Start with zero assumptions about media and about your store. "I also stated that the media are the messengers, and your content is the message." If you wipe the slate clean, that includes your brand. Imagine you are beginning from scratch. You have a store full of furniture but no customers. How do you begin to attract customers? Even if the customer has been attracted to visit your store by traditional media, they will arrive with certain expectations. Your success as a brand will be determined by whether their expectations are met, exceeded, or disappointed. The process of the shopping experience is set into motion by the curb appeal of your building, parking lot and grounds. It continues with the appearance of the showroom, your sales consultants, and your other personnel. It usually concludes with your delivery people, and hopefully a follow-up telephone call. A friend and client of mine, Larry Johnson, was facing a seemingly impossible situation this year. After being in business in Duluth, Minnesota since 1917, Johnson Bros. Furniture was confronted by a downtown business environment that had severely deteriorated. Few people were interested in shopping in downtown Duluth anymore. The bulk of the business was going to the Big Box stores in the outlying areas. Larry Johnson decided to do a store closing event. I encouraged him to conduct the event himself, but Johnson believed he needed outside sales help, so he brought in an outside company. The GOB was expensive, and not nearly as successful or profitable as he had hoped. Now Larry Johnson was in a real pickle. He still owned an old building in downtown Duluth and he still owned a large inventory of furniture. His original brand was gone, and could not be revived. Moreover, he was not ready to retire, being relatively young and an experienced furniture man with good vendor relationships. Larry Johnson wiped the slate clean and began to think. What do people want? What retail niche is not being filled in Duluth? He deduced that, although there was fierce Big Box competition, there was no authentic outlet store selling good furniture brands at discounted prices. He thought about the possibility of a strong discount operation, perhaps one that was open only four days a week. His location was a problem, but not insurmountable. Although his building was old it was very visible from a main freeway. Although the sign ordinances in Duluth are stringent, he thought there may be a way to do something dramatic. Johnson naturally chose to be open the most productive days of the week for a furniture store: Friday, Saturday, Sunday, and Monday. This idea would save money on media, requiring only one ad or flyer a week, some direct mail, and some radio. These plus the internet would be more than ample media coverage. The next issue was the old, drab building. It would need some kind of a dramatic transformation that would not cost a fortune. Only a relatively small sign could legally be used for each face of the building. The solution was awesome. 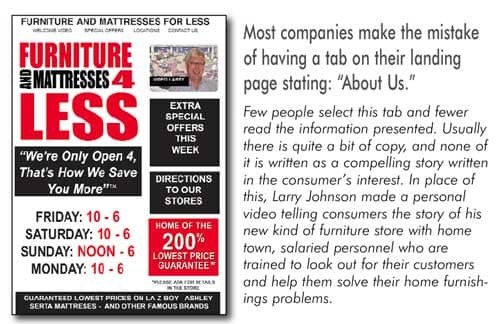 Johnson learned that a website is an absolute essential for a furniture store, but it does not need to be expensive. The basic landing page needs to communicate immediately to the potential retail customer the essential six elements of Journalism 101: WHO? WHAT? WHEN? WHERE? HOW? And WHY? WHAT? Furniture and Mattresses 4 Less. Larry says “Our name is our brand. It states what we are and what we do. We are a furniture store with authentic name brands at prices guaranteed to be the lowest.” Special offers change each week on the website. WHEN? Open only four days a week, and hours are clearly exhibited. WHERE? A tab leads to a clear, professional map. HOW? Credit terms are described in the special offers section. WHY? This is a key factor that is not fully utilized by most furniture retailers. A few, like Ethan Allen, communicate value, comfort, style, pride and other benefits. However, for most middle-end stores price is virtually the only driving factor. Admittedly, the Furniture and Mattresses 4 Less brand is obviously a price appeal. However, the mantra of the Johnson advertising and in-store selling strategy is: Do not mention price without mentioning value, style and other benefits. Most stores rely solely on claims for lower prices rather than enhancing the value of their products. A prospective customer must never leave the store empty-handed. When shoppers shop for furniture it becomes very hard to remember what they saw and where they saw it. 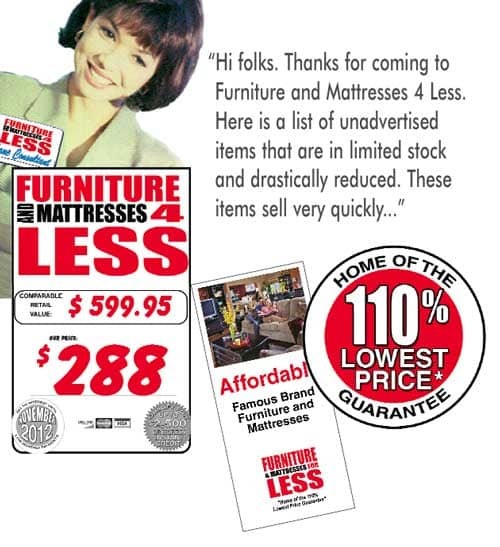 A flyer was developed with all the benefits and advantages of shopping at Furniture and Mattresses 4 Less. Sales Consultants should have name tags. These are most effective when they also feature a sales message. The name of the store is not necessary. Inexpensive name tags can be created and printed on glossy paper. The sales message could be a unique credit offer, or an event name. The greeting process should be augmented by a handout. Customers appreciate getting something of perceived value. The sales consultant approaches and says something like: “Hi folks. Thanks for coming to Furniture and Mattresses 4 Less. Here is a list of unadvertised items that are in limited stock and drastically reduced. These items sell very quickly. If you are looking for anything special let me know and I can help you find it.” This or a similar statement allows the sales consultant to enter into a conversation and begin developing a relationship. Price tags and other point of purchase materials should be developed and kept fresh and interesting. These should be considered “silent salespersons” that tastefully remind customers that they are in a different kind of store. Window Signs should be developed for special events. A well-written press release should be developed. A soft opening of two or three weeks should be planned to iron out any bugs before the grand opening sale. Painting was soon in progress and suddenly people were asking what was going on. There was a different atmosphere, and a sense of progress. The feeling of impending doom was replaced by positive anticipation of success. In Part Three of this series, we will examine Direct Mail, Radio, Television, Websites and the Internet, and see how these media can be used to contribute to your success. Then we will show how to create a killer mix of media that will leverage maximum sales and profits. Larry Mullins is a contributing editor for Furniture World and has 30+ years experience on the front lines of furniture marketing. Larry’s mainstream executive experience, his creative work with promotion specialists, and mastery of advertising principles have established him as one of the foremost experts in furniture marketing. His turnkey High-Impact programs produce legendary results for everything from cash raising events to profitable exit strategies. His newest books, THE METAVALUES BREAKTHROUGH and IMMATURE PEOPLE WITH POWER … How to Handle Them have recently been released by Morgan James Publishing. Joe Girard, “The World’s Greatest Salesman” said of this book: “If I had read Larry Mullins’ book when I started out, I would have reached the top much sooner than I did.” Larry is founder and CEO of UltraSales, Inc. and can be reached for a free, no-obligation consultation directly at 904.794.9212, or email him at Larry@LarryMullins.com. See more articles by Larry at www.furninfo.com or www.ultrasales.com.